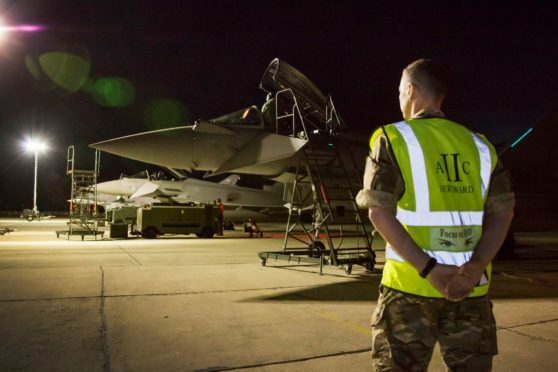 The Typhoons from RAF Lossiemouth will be in Romania until September. Four Typhoons from RAF Lossiemouth have touched down in Romania as part of Nato’s enhanced air policing mission. The Baltic defence was instigated in 2004 but has intensified in recent years following the beginning of the Russia and Ukraine conflict in Crimea. The Moray personnel will be based at the Mihail Kogalniceanu Airbase (CORR), near Constanta in Romania, until September. Flight crews from the base were last deployed as part of the Nato mission two years ago, when they were deployed to Estonia. The fighters from II (Army co-operation) Squadron have joined 135 Expeditionary Air Wing, from RAF Leeming in Yorkshire, and will fly in partnership with Romanian Mig-21 aircraft. Wing Commander Chris Ball, officer in charge of 135 EAW, said: “This is an important role for us that will build upon the success of the last missing to help secure Nato airspace in the Black Sea region. The mission was devised to provide necessary aircraft to countries who do not have the means to defend their own airspace – including Albania, Estonia, Latvia, Lithuania and Slovenia. During previous deployments on the mission to Estonia, Typhoons from RAF Lossiemouth were launched 17 times across a four-month spell to intercept 36 aircraft. On one occasion, a squadron of 10 Russian jets were monitored before they were escorted from the area. The Royal Air Force maintains a rota system with Nato allies to defend the organisation’s eastern boundary from intruders. Typhoons from the Italian Air Force have already been deployed to Estonia this year to take over from Belgian counterparts while the US Air Force spent time in Lithuania last year.